Dan Rather and Director traveled down the narrow path of Tad’s memory .Director was attempting to find Tad’s imagination on the map. “Sorry, mate, this blasted thing is impossible to read. He said. “This meeting is for what exactly”, Dan Rather asked, somewhat impatiently. “Oh, we need your opinion as to whether or not we should produce this writer’s show. We need you to tell us if the characters are sympathetic and so on and so forth. We were thinking you could host a panel discussion”. “Yes”, Director said realizing he had stumbled on to something diabolically brilliant. “Well, okay I supposes, it does sound interesting. Is there a payphone in this head? I want to call my wife and tell her I’ll be late for dinner”. “The panel members are coming from inside the writers head”, Dan Rather said becoming quite confused. “Well, um… Director thought for a moment. “We’re trying to get all of his very harshest critics and the people whose opinion he values most together to judge the show”. Director admitted. The two men made their way to a very small room which was strewn with candy wrappers and pornographic magazines. Naked women roamed about randomly touching one another’s breasts. In the center of everything there sat a tall thin brunette woman who resembled Elizabeth Hurley. She was reading Cosmopolitan and doing some sort of mouth exercises. She was sitting on a bed surrounded by basketball trophies. “Can I help you with something” she said when she saw the two men enter the room. “Yes, I’m looking for Tad’s dream girl. I take it that’s you? “Why yes I’m Dora”, she said extending a hand. “I am , said another. 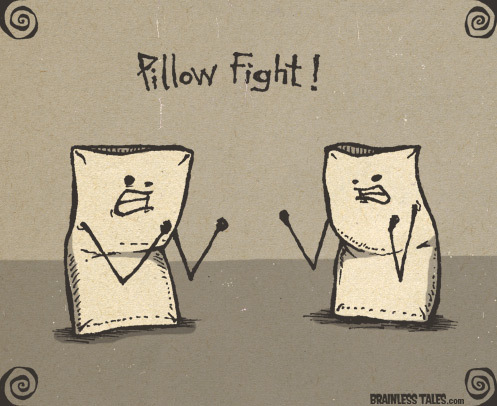 What can only be described as an extremely violent pillow fight broke out. Two of the women began wrestling and two began having what appeared to be a breast fight. “Dora, Tad’s thought up a television show and he needs your opinion”, Director said. “”Okay, let me just get dressed. She put on a G-string and a red lacy bra. She slipped into a form fitting nurse’s outfit. The three of them snuck out of the room in the middle of the commotion. “He’ll fit right in in Hollywood,” Dan Rather commented as they left the small imagination and headed for repressed memories. The trio headed towards the back of the head to locate an authority figure from Tad’s early childhood. There was some artistic disagreement between Director and Dan Rather as to whether a cool kid or a teacher would be in order. Director couldn’t take his eyes off Dora. He tried to concentrate on what Dan Rather was saying but he was distracted by the perfect ebb and flow of her behind. They arrived at the subconscious to be greeted by a tall thin bearded man of about forty five. “Hi, I’m doctor Applewood. Are you new? Don’t tell me, he said to Dora, “ I bet your from that bar where they had trivia night and he was trying to impress you? I’ve never seen a man play trivia so poorly. “Well, I might be a pretty good choice. I was Tad’s child Psychiatrist. Dr. Applewood said. “What was wrong with him?” Dan Rather asked. “Yes, do join us. Caroline will be thrilled”, Director exclaimed. They all headed to the intellect for a college professor.